In the last few days I have been tidying my cupboard, looking through old photos, trying to take pictures of old ones of my mom and her friends to post on Facebook. Some years ago my sister left her photographs with me. She was moving countries and her home had been sold. And while I always see the torn plastic packet I've stored them in, I rarely look at them. I do look, and then stop. It hurts too much to look at pictures of my parents. Not that I don't want to remember them, it's too hard. I still don't look at pictures of my dad's funeral and I haven't looked at the CD of my mum's. Last week I opened the steel cupboard to look for something and decided to have a look at the photos. There were pictures of my parents and of my brothers when they were in their 20s. My nephews as young babies and a lot of blurred ones. Hard to look at but difficult to throw away. You see, I've lost all the negatives -- a series of house moves, thefts at my parents' home. Yes, sometimes thieves like to steal photographs. Especially when they are related to you. Now more than ever I look at the few pictures I have of my parents as young people and wonder why I can't see them that way -- with dreams, more interesting than those of any of their children, especially while remembering my dad's stories of his youth and the pranks he played. Each time I look at pictures dating to the 1950s and 1960s I wonder why they got lost and why we haven't got around to 'finding' them. If that makes any sense. 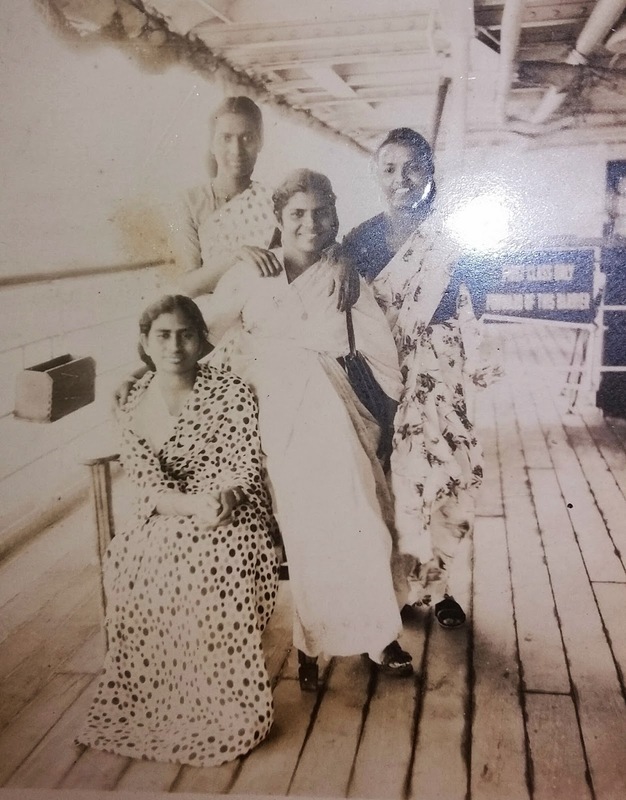 My mum (extreme left). I don't know who the others are. This is probably before she married and when she worked as a nurse in Bahrain. c.1950s. I am in awe of her when I look at this picture. She was intrepid, for sure. 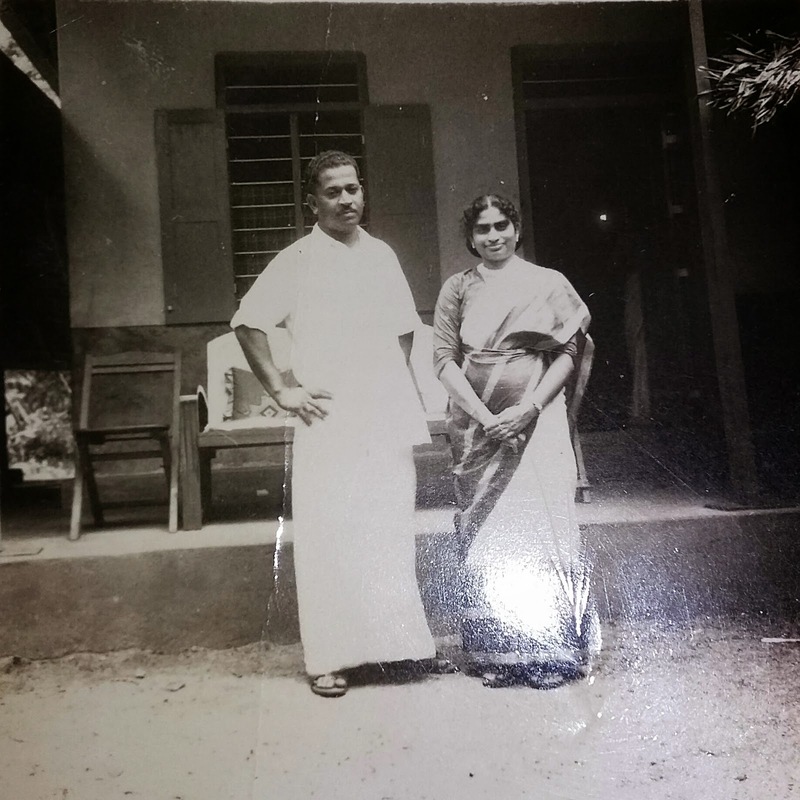 My parents on their wedding day in 1959 in front of my mother's parents' home in Kerala. The old house was recently demolished to make way for a new one. Fish lived in a tank in the protagonist's home, which was managed by Genie, the narrator's erstwhile manservant and now friend. In this series, Fish and Genie, who flew the coop, return at Christmas and decide to stay a few weeks. They are joined by an old friend Nobby, a mosquito who loves rum and cake and is kept in check by Fish. Genie is a former thug turned man servant. He was the right hand man of notorious South Indian villain Mogi Singh. Genie is now reformed. Fish comprise Gregory, the intellectual who reads, Portas, the fitness freak, Dimitri, the narrator's favourite fish and confidante and Penaaz and Pervez the only pair in the tank and thinkers who are ever fearful of losing their loved ones. This Christmas they have a visitor from the North Pole - an elf called Donny. Keenly follows the adventures of her erstwhile companions, the Fish, Norbert, the mosquito, and Genie, her former man servant.